COP-21, to takes place in Paris until December 11th 2015, has the main objective to achieve, for the first time, a universal and binding agreement to effectively fight against climate change and boost the transition towards sustainable and low-carbon economies and societies. To achieve this objective, a key piece of the puzzle are the Intended Nationally Determined Contributions from each country (or INDCs). The INDCs, as the name implies, are the contributions that each country would be willing to put on the negotiation table to, unconditionally and conditionally (this mainly related to the availability of international funding), limit their Greenhouse Gases (GHG) emissions so that climate change would imply to go beyond an increase of 2 ° C by the end of the century. These contributions may include, as appropriate, quantifiable information on the benchmark (including the base year) time frames and / or periods of application, scope and coverage, main proposed actions, planning processes, assumptions and methodological approaches including estimating and accounting for emissions of greenhouse gases. It should also include assessment of each country on how the proposed contribution is fair and ambitious in the light of its national circumstances, and how it contributes to the objective of the Convention. After an analysis of the proposed contributions by leading South American countries, unfortunately the least we can say is they are very shy. While all countries propose emission reductions GHG by 2030, this reduction is relative to the projection that each country is making on how these emissions would evolve over the next 15 years. Most countries have made a projection of these emissions above what current policies and expected developments could allow, overstating projected emissions. Therefore, when considering proposed percentages of reduction on emissions, what we get is that the commitments actually involve no (or very little) effort and without changing virtually nothing, the countries would manage to fulfill their goals. This is especially true for Argentina and Chile, where despite proposing emission reductions compared to 2030 theoretical levels, both countries are increasing their emissions in absolute terms by about 60% and 75% respectively over 2010 emissions. If we want to limit the impact of climate change at 2 ° C, this – as you will soon realize- is not sustainable. From my point of view, the great absentee from national contributions is energy efficiency. Only a few countries mention improving energy efficiency and none of them put concrete and specific goals. 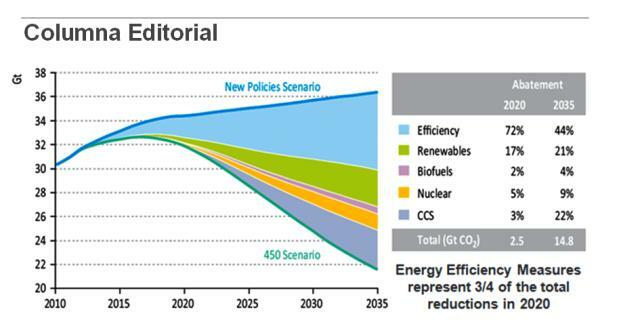 The International Energy Agency (IEA) has developed a number of scenarios to address climate change. The so-called “450 Scenario” sets out an energy pathway consistent with the goal of limiting the global increase in temperature to 2°C by limiting concentration of greenhouse gases in the atmosphere to around 450 parts per million of CO2. In this scenario, the role of energy efficiency is essential, not only because it is the individual action with more impact at the end of the period considered (44% in 2035) but also because it has the greatest impact in the short term (energy efficiency represents 72% of potential GHG reductions by 2020!). Therefore, I believe that leaving energy efficiency out (or at least very relegated) from national contributions is leaving out perhaps the most powerful weapon we have to fight climate change without sacrificing our standard of living and the economic growth of our countries. Today energy efficiency solutions are a reality, able to provide us savings of up to 30% of our energy consumption and are available to everyone. From the vision of a businessman or even a particular, the equation is simple: most energy efficient solutions have a return on investment ranging from 3 to 12 months at most. Therefore, in less than a year the investment has repaid by itself. Repayment periods as short as these ones help taking the investment decision: it can be funded with OPEX money because, if planed well in advance, it can be accommodated within a yearly budget and be paid out of the savings it generates! Therefore, energy efficiency has not only environmental sense but economic too. 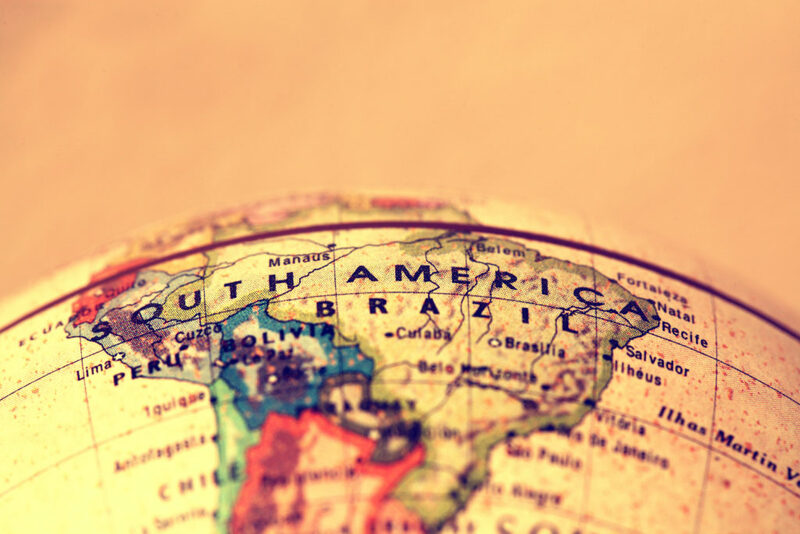 It will make South American economies more efficient, competitive and sustainable. 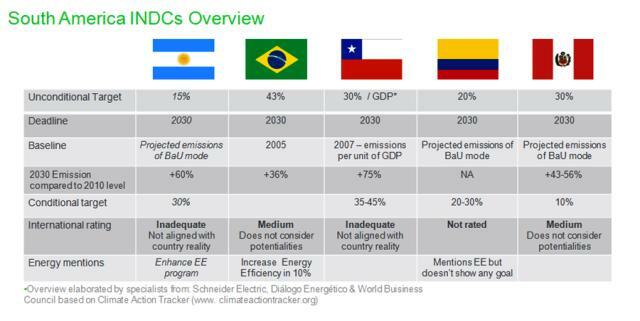 South American countries have, in most cases, an enviable energy matrix and the potential to become benchmarks of sustainability worldwide. Missing this opportunity will mean that letting another development train pass by. From the political will of our governments (establishing appropriate objectives and defining mechanisms to promote their implementation) and our consciousness as businessman and citizens depends whether we seize or not.